By Mateusz Mucha, James Mathison and Wojciech Sas - PhD candidate. How to use the probability calculator? 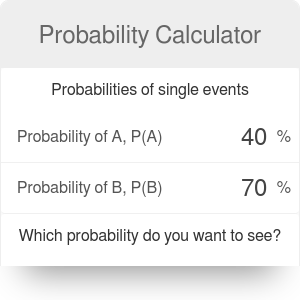 With the probability calculator you can investigate the relationships of likelihood between two separate events. For example, if the chance of A happening is 50%, and the same for B, what are the chances of both happening, only one happening , at least one happening, or neither happening, and so on. Our probability calculator gives you 6 scenarios, plus 4 more when you enter in how many times the "die is cast", so to speak. As long as you know how to find the probability of individual events, it will save you a lot of time. increase your knowledge about the relationship between probability and statistics. The probability of ♥: P(♥) etc. 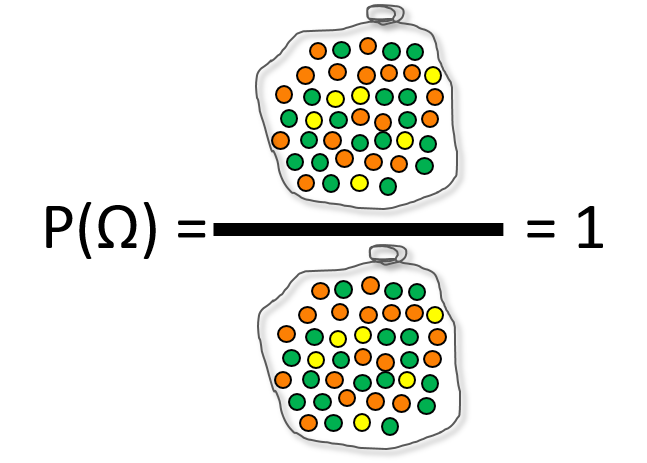 Let's take a look at an example with multi-colored balls. We have a bag filled with orange, green and yellow balls. Our event A is picking a random ball out of the bag. We can define Ω as a full set of balls. The probability of event Ω, which means picking any ball, is naturally 1. In fact, a sum of all possible events in a given set is always equal to 1. Now let's look at something more challenging - what's the likelihood of picking an orange ball? To answer this question, you have to find the number of all orange marbles and divide it by the number of all balls in the bag. You can do it for any color, e.g. 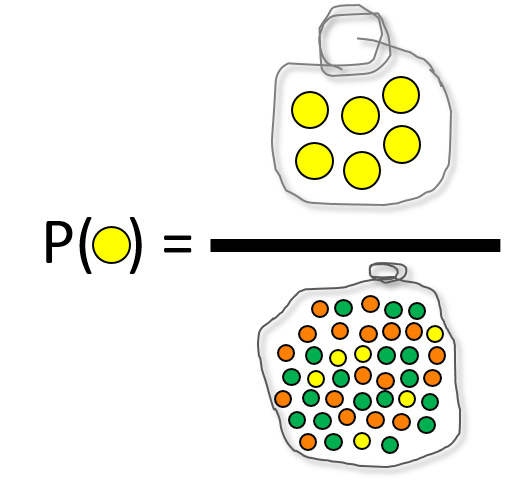 yellow, and you undoubtedly notice that the more balls in particular color, the higher the probability of picking it out of the bag if the process is totally random. We can define a complementary event, written as Ā or A', which means not A. 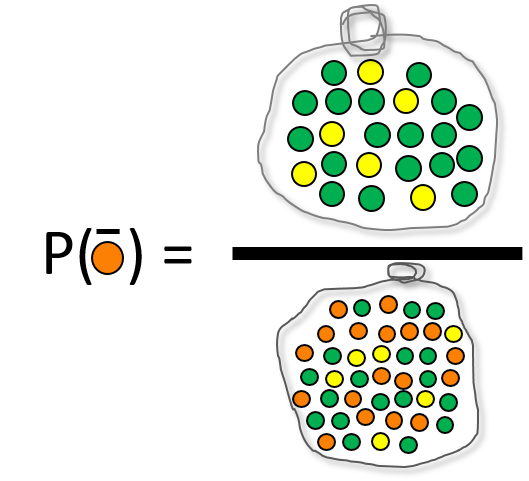 In our example, the probability of picking out NOT an orange ball is evaluated as a number of all non-orange ones divided by all marbles. The sum P(A) + P(Ā) is always 1 because there is no other option like half of a ball or semi-orange one. Now, try to find the probability of getting a blue ball. No matter how hard you try you will fail just because there is not even a single one in the bag, so the result is equal to 0. We use intuitive calculations of probability all the time. Knowing how to quantify likelihood is essential for statistical analysis. It allows you to measure this otherwise nebulous concept called "probability". 1. Define the problem you want to solve. Your problem needs to be condensed into two distinct events. If you want to calculate the probability of an event in an experiment with a number of equally possible trials, you can use the z-score calculator to help you. 2. Find the probability of each event. Now, when you know how to estimate the likelihood of a single event, you only need to perform the task and obtain all of the necessary values. 3. Type the percentage probability of each event in the corresponding fields. The calculator will also show the probability of four more scenarios, given a certain number of trials. You can change the number of trials, as well as any other field in the calculator, and the other fields will automatically adjust themselves. This saves a ton of time if you want to find out, for example, what the probability of event B would need to become in order to make the likelihood of both occurring 50%. If the set of possible choices is extremely large and only a few outcomes are successful, the resulting probability is tiny, like P(A)=0.0001. It's convenient to use the scientific notation in order not to mix up the number of zeros. One of the most crucial considerations in the world of probabilities is the one whether the events are dependent or not. Two events are independent if the occurrence of the first one doesn't affect the probability of the occurrence of the second one, e.q. if we roll a perfectly balanced standard cubic die, the likelihood of getting ⚁ (the same as getting ⚃ or any other number) is equal to 1/6. Let's say you have two dice rolls, and you get ⚄ in the first one. If you ask yourself what's the probability of getting ⚁ in the second turn, the answer is 1/6 once again because of the independence of events. The way of thinking, as well as calculations, change if one of the events interrupts the whole system. This time we're talking about conditional probability. Let's say we have 10 different numbered billiard balls, from ➀ to ➉. You choose a random ball, so the probability of getting the ➆ is precisely 1/10. Suppose you picked the ➂ and removed it from the game. Then you ask yourself, once again, what is the chance of getting the ➆. 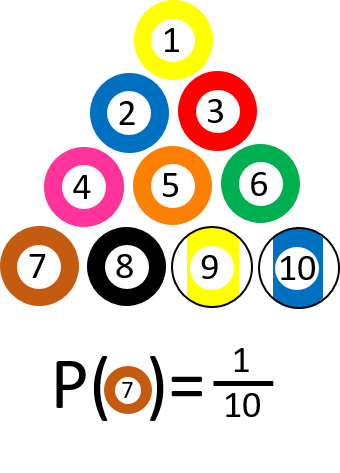 The situation changed because there is one ball with ➆ out of nine possibilities, which means that the probability is 1/9 now. In other words, the question can be asked: "What's the probability of picking ➆ IF the first ball was ➂?" Let's look at another example: imagine that you are going to sit an exam in statistics. You know from your older colleagues that it's challenging and the probability that you pass in the first term is 0.5 (18 out of 36 students passed last year). Then let's ask yourself a question: "What's the probability of passing IF you've already studied the topic?" 20 people admitted that they were reviewing their notes at least once before the exam and 16 out of those succeeded, which means that the answer to the last question is 0.8, and it denotes that this additional condition really matters if we want to find whether the studying changes anything or not. If you still don't feel the concept of conditional probability, let's try with another example: you have to drive from city X to city Y by a car. The distance between them is about 150 miles. On the full tank, you usually can go up to 400 miles. If you don't know the level of fuel, you can estimate the likelihood of successfully reaching the destination without refueling. And what if somebody has already has filled the tank? Now you're almost sure that you can make it unless other issues prevent it. P(A∩B) = P(B|A) * P(A). You are able to ask a question: "What is the probability of A given B if I know the likelihood of B given A?". This theorem sometimes provides surprising and unintuitive results. The most commonly described examples are drug testing and illness detection, which has a lot in common with the relative risk of disease in the population. Let's stick to the second one. In a group of 1000 people, 10 of them have a rare disease. Everybody had a test, which shows the true result in 95% of cases. So now we want to find the probability of a person being ill if his test result was positive. Without thinking, you may predict, by intuition, that the result should be around 90%, right? Let's make some calculations and estimate the correct answer. Use the Bayes' theorem to find the conditional probability P(I|+) = P(+|I) * P(I) / P(+) = 0.95 * 0.01 / 0.059 = 0.161. Hmm... it isn't that high, is it? It turns out that this kind of paradox appears if there is a significant imbalance between the number of healthy and ill people, or in general, between two distinct groups. If the result is positive, it's always worth repeating the test to make an appropriate diagnosis. We can distinguish between two kinds of probability distribution, depending on whether the set of random variables is discrete or continuous. A discrete probability distribution describes the likelihood of the occurrence of countable, distinct events. One of the examples is binomial probability which takes into account the likelihood of some kind of success in multiple turns, e.q. while tossing a coin, whereas in the Pascal distribution (also known as negative binomial) the fixed number of successes is given, and you want to estimate the total number of trials. The Poisson distribution is another discrete probability distribution and is actually a particular case of binomial one. The probability mass function can be interpreted as another definition of discrete probability distribution - it assigns a given value to any separate number. 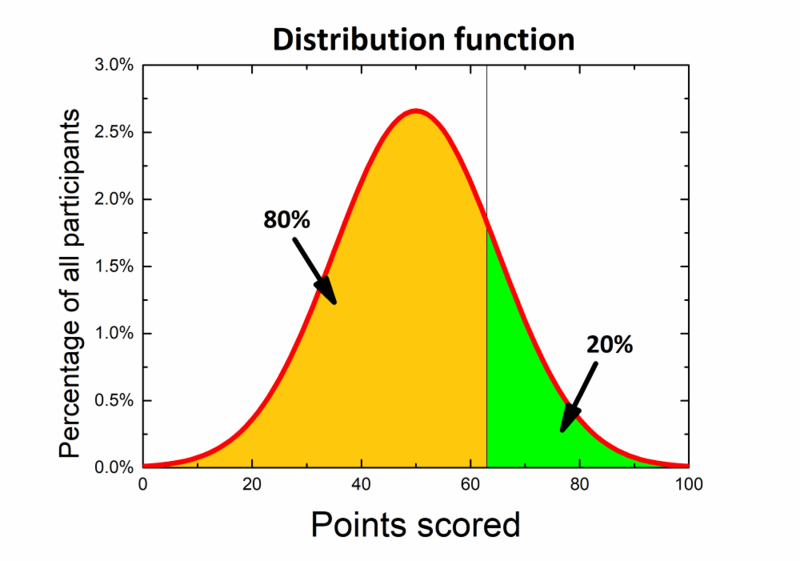 The geometric distribution is an excellent example of the use of the probability mass function. A continuous probability distribution holds information about uncountable events. It's impossible to predict a likelihood of a single event (like in discrete one), but rather that the event can be found in some range of variables. The normal distribution is one of the best-known continuous distribution function, and it describes a bunch of properties within any population, e.q. the height of adult people or the IQ dissemination. If you are more advanced in probability theory and calculations, you definitely have to deal with SMp(x) distribution which takes into account the combination of several discrete and continuous probability functions. 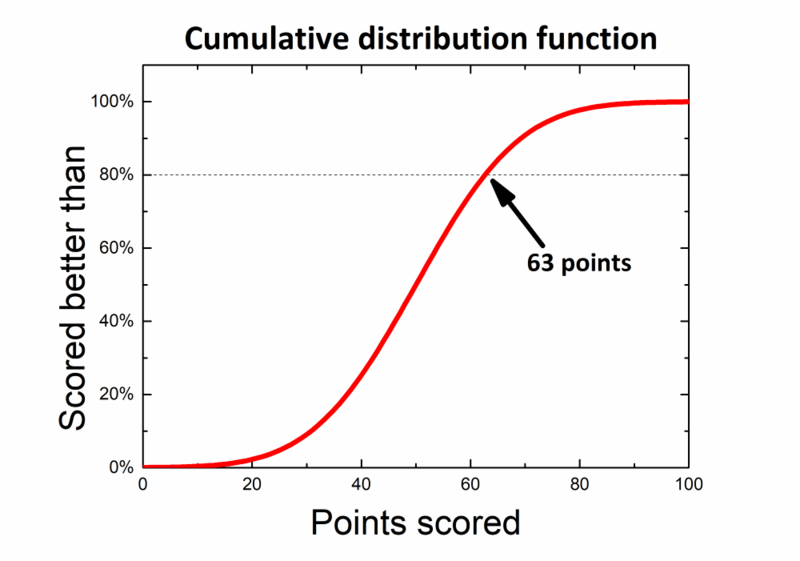 For each probability distribution, we can construct the cumulative distribution function (CDF). It tells what's the probability that some variable will take the value less than or equal to a given number. Let's say you participate in a general knowledge quiz. The competition consists of 100 questions, and you earn 1 point for a correct answer, whereas for the wrong one there are no points. A lot of people have already finished, and out of the results, we can obtain a probability distribution. Rules state that only 20% best participants receive awards, so you wonder how well you should score to be one of the winners. If you look at the graph, you can divide it in a way that 80% of the area below is on the left side and 20% of the results are on the right of the desired score. What you are actually looking for is a left-tailed p-value, but there is also another way to find it if we use a cumulative distribution function - just find the value 80% on the axis of abscissa and the corresponding number of points without calculating anything! Almost every example which is described above takes into account the theoretical probability. So a question arises: what's the difference between theoretical and experimental (also known as empirical) probability? The formal definition of theoretical probability is the ratio between the number of favorable outcomes to the number of every possible outcome. It relies on the given information, logical reasoning, and tells us what we should expect from an experiment. 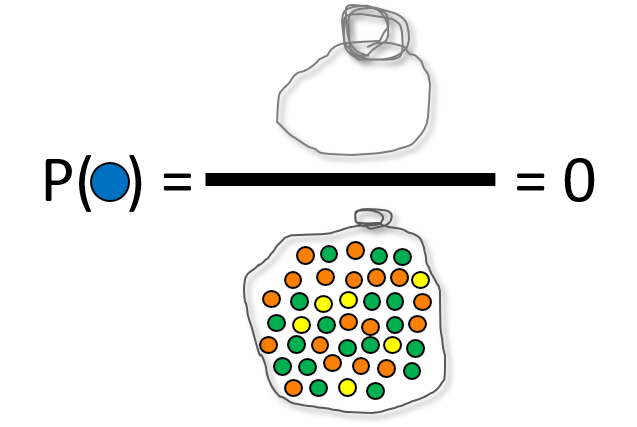 Just look at bags with colorful balls once again. There are 42 marbles in total, and 18 of them are orange. 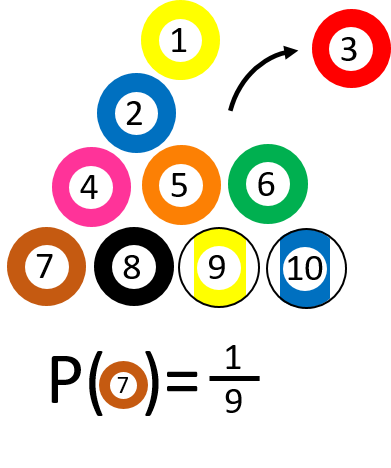 The game consists in picking a random ball from the bag and put it back, so there are always 42 balls inside. Applying the probability definition, we can quickly estimate it as 18/42 or simplifying the fraction, 3/7. It means that if we pick 14 balls, there should be 6 orange ones. On the other hand, the experimental probability tells us precisely what happens when we perform an experiment instead of what should happen. It is based on the ratio of the number of successful and the number of all trials. Let's stick with the same example - pick a random marble from the bag and repeat the procedure 13 more times. Suppose you get 8 orange balls in 14 trials, it means that the empirical probability is 8/14 or 4/7. As you can see, your outcome differs from the theoretical one. It's nothing strange because when you try to reiterate this game over and over sometimes you will pick more, and sometimes you will get less, and sometimes you will pick exactly the number predicted theoretically. If you sum up all results, you should notice that the overall probability gets closer and closer to the theoretical probability. If not, then we can suspect that picking a ball from the bag isn't entirely random, e.g. 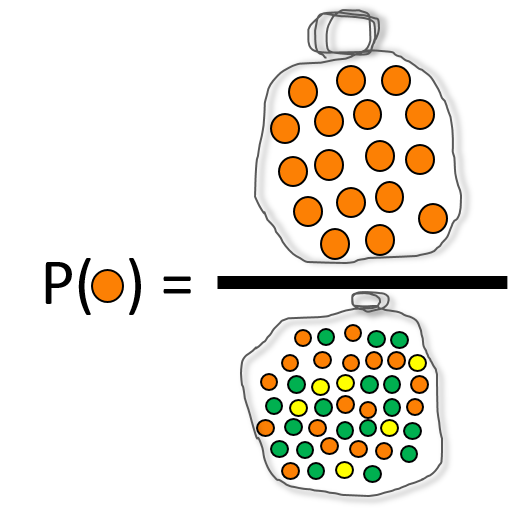 the balls of different colors have unequal sizes so you can distinguish them without having to look. Both statistics and probability are the branches of mathematics and deal with the relationship of the occurrence of events. However, everyone should be aware of the differences which make them two distinct areas. 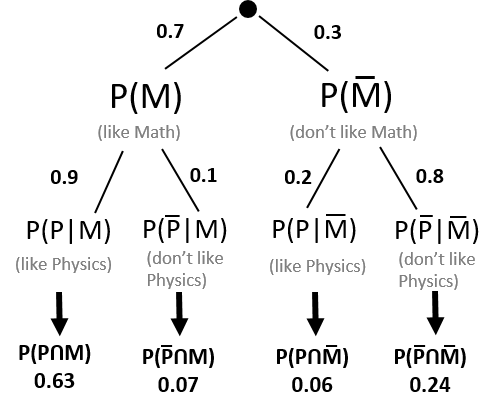 Probability is generally a theoretical field of math, and it investigates the consequences of mathematical definitions and theorems, while statistics is usually a practical application of mathematics in everyday situations, and tries to attribute sense and understanding of the observations in the real world. Probability predicts the possibility of events to happen, whereas statistics is basically analyzing the frequency of the occurrence of past ones and creates a model based on the acquired knowledge. Imagine a probabilist playing a card game, which relies on choosing a random card from the whole deck, knowing that only spades win with predefined odds ratio. Assuming that the deck is complete, and the choice is completely random and equitable, he deduces that the probability is equal to ¼ and a bet can be made. A statistician is going to observe the game for a while first, to check if, in fact, the game is fair. After verifying (with acceptable approximation) that the game is worth playing, then he will ask the probabilist what he should do to win the most. Each of these methods has its advantages and drawbacks, but most of them are satisfactory. Significant benefits of probability sampling are time-saving and cost-effectiveness since the limited number of people needs to be surveyed. The simplicity of this procedure doesn't require any expertise and can be performed without any thorough preparation. As you could have already realized, there are a lot of areas where the theory of probability is applicable. Most of them are games with a high random factor, like rolling dice or picking one colored ball out of 10 different colors, or many card games. Lotteries and gambling are the kinds of games which extensively use the concept of probability and the lack of social knowledge about it. Of course, somebody wins from time to time, but the likelihood that the person will be you is extremely small. Probability theory is also used in many different types of problems. Especially when talking about investments, it is also worth considering the risk to choose the most appropriate option. Our White Christmas calculator uses some historical data and the probability knowledge to predict the occurrence of snow cover for many cities during Christmas. Mateusz Mucha, James Mathison and Wojciech Sas - PhD candidate. Probability Calculator can be embedded on your website to enrich the content you wrote and make it easier for your visitors to understand your message.